Honoring UDance (from left) UD President Patrick Harker, Megan Rudolphi, Jill Finfrock, Michael Smyth and Jefferson Awards President Sam Beard. Honoring Lori's Hands (from left) UD President Patrick Harker, Hillary Brown, Alexa Rivadeneira, Lisa Centrone, Sarah LaFave, Kaitlyn Hall, Emily Floros and Jefferson Awards President Sam Beard. 1:09 p.m., Oct. 8, 2013--Two University of Delaware registered student organizations -- UDance and Lori's Hands -- were recognized in a campus ceremony Oct. 7 for taking first place honors in the national 2013 Youth Service Challenge of the Jefferson Awards for Public Service. Speaking at the ceremony, UD President Patrick Harker said that service is "important to who we are and fundamental to what we do. "If we don't put our learning to work helping people, if we don't put our heart and soul and every ounce of energy into making this world a better place, we've got no business being here at all," he said. Harker quoted Woodrow Wilson -- "We are not put into the world to sit still and know. We are put in it to act" -- and added, "UDance and Lori's Hands are acting." 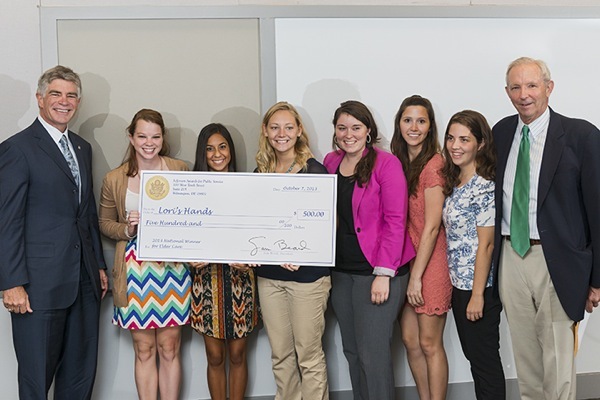 Each group was presented a check from Sam Beard, president of the Jefferson Awards. Beard, who has dedicated his working life to public service, has initiated and then chaired programs for seven U.S. presidents, from Richard Nixon to George Bush. Speaking to the honorees, Beard discussed the Jefferson Awards' commitment to reach out to young people 25 and younger and to help them become global service leaders. 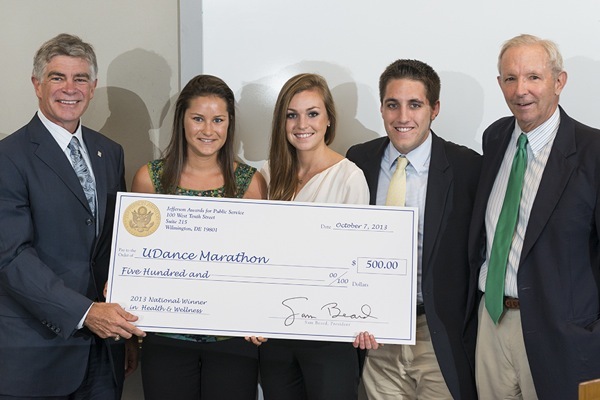 UDance, UD's largest student-run philanthropy, was awarded first place in the health and wellness category. Since it was founded in 2007, UDance has presented annual 12-hour dance marathons, raising more than $1.4 million for the Andrew McDonough B+ Foundation to fight pediatric cancer and support families battling on behalf of their children. Last spring alone, UDance raised more than $550,000. Lori's Hands, founded in 2009 by Sarah LaFave in memory of her mother, received first place in the elder care category. Lori's Hands serves families affected by chronic illness and assists them in overcoming the challenges of day-to-day chores. A new service-learning course at UD combines classroom and experiential learning -- pairing students with Lori's Hands' clients. The Youth Service Challenge is conducted annually to recognize outstanding youth service projects making a positive impact in the world. This year, 27 projects earned national recognition and monetary awards in nine categories: animal rights; community building and citizenship; education and literacy; elder care; environment and sustainability; health and wellness; hunger, homelessness and poverty; peace and justice; and service to youth. The Jefferson Awards for Public Service was founded in 1972 by Jacqueline Kennedy Onassis, U.S. Sen. Robert Taft and Sam Beard to create a Nobel Prize for public and community service. The awards serve to recognize, inspire and activate volunteerism and public service throughout the United States. For more information about the awards, see the website.